Purdue is home to a recently launched academic journal about political science called Politics, Groups, and Identities. The quarterly journal is the official academic publication of the Western Political Science Association (WPSA), which is based at Portland State University and is a group of more than 1,200 political scientists. Politics, Groups, and Identities published its first issue in March and counts four Purdue faculty members among its seven co-editors. 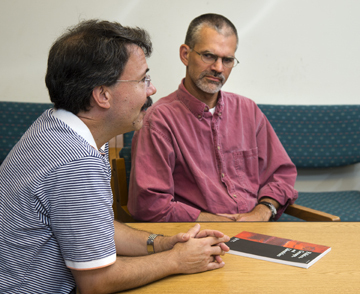 Eric Waltenburg, associate professor of political science, is the journal's lead editor this academic year. "Politics, groups and identities are huge issues in political science, the social sciences and the world at large," says Jay McCann, professor of political science and one of the journal's co-editors. "This journal features the best scholarship on social groups and explores the politics of gender, race, ethnicity, religion, sexuality, class and other dimensions of identity and structural disadvantage. We're proud to host this journal here at Purdue, and we think its presence adds a lot of visibility to our department and college nationwide." Each issue of the journal contains about five research articles as well as a review essay, in which an author discusses a recent event from a scholarly standpoint, and a dialogue, in which several authors respond to a chosen topic. For example, in the journal's September issue, several authors contribute to a dialogue about gender and ethnicity in European politics. When WPSA sought to establish the journal, it requested proposals for editorial teams from universities that wished to host it. Purdue's proposed team consisted of Rosalee Clawson, professor and head of political science; McCann; Waltenburg; and S. Laurel Weldon, professor of political science and interim vice provost for faculty affairs. All four are now the journal's co-editors along with Lisa Garcia Bedolla from the University of California, Berkeley; Ange-Marie Hancock from the University of Southern California; and Kerry Haynie from Duke University. All co-editors are members of WPSA. Waltenburg and McCann attributed Purdue's successful team proposal in part to the support of Irwin Weiser, dean of the College of Liberal Arts, and Bert Rockman, professor of political science. Rockman was head of the political science department when the editorial team submitted its proposal. The journal has received heavy interest from scholars. So far this year, the co-editors have received about 110 article submissions. Each editorial cycle, the co-editors and the journal's editorial assistant -- who is a Purdue graduate student -- pare down submissions. Experts in the relevant field or area of interest review each submission, and peer reviewers make recommendations related to revisions and whether the submission should be published. The process is double-blinded, meaning neither a submission's author nor reviewer are aware of each other's identity. McCann says the journal's co-editors have been promoting it strenuously at political science conferences around the country. "Since this is a new journal, we're trying to build interest in it as much as we can," McCann says. "The topics discussed in the journal are incredibly relevant not only to political science but to conversations happening in the world at large. For that reason, we hope to grow the journal's audience to include policymakers, journalists and others, both to increase the journal's reputation and to continue to build upon our great tradition of political science here at Purdue." The journal is distributed to all members of the WPSA, and some libraries receive subscription copies, McCann and Waltenburg say. More information about the journal can be found here.